Many studies have looked at factors that put drug users at increased risk of overdose. In particular, there have been several studies on witnessed overdoses or the circumstances around non-fatal overdoses. The papers in this section identify a range of risk factors – including a reluctance to call for emergency help, injecting drugs (as opposed to other routes of administration such as smoking), the extent of drug user knowledge of overdose, groups with particularly low drug tolerance (such as occasional injectors or those who have recently been released from prison, or returning from a period of detoxification), previous suicide attempts, severity of druguse, and broader social and structural factors such as national emergency response systems. Baca CT & Grant KJ (2007) What Heroin Users tell us about Overdose. Journal of Addictive Diseases, 26(4), pages 63 – 68. This study describes the experiences of 101 heroin users in terms of non-fatal overdoses they themselves have experienced, as well as overdose incidents that they have witnessed. Heroin-related overdoses were found to be common in the sample, and in most cases several other people were present. However, ambulances were only called in 42 of the 95 witnessed overdoses – often through concerns around police involvement. Almost all respondents expressed willingness, if trained, to use rescue breathing and to inject naloxone to aid an overdose victim. Unfortunately, we are unable to provide free access to this article at this stage. Brugal MT, Barrio G, De La Fuente L, Regidor E, Royuela L & Suelves JM. (2002) Factors associated with non-fatal heroin overdose: assessing the effect of frequency and route of heroin administration. Addiction, 97, pages 319 – 327. This study examines the risk factors associated with non-fatal heroin overdose, with a particular focus on the frequency and route of heroin administration. The substantial sample for the study consisted of 2556 participants who were being treated for heroin dependence in 164 outpatient facilities in Spain. The researchers found that the rapid introduction of large quantities of heroin into the blood (as occurs when injecting) is associated with a significant risk of overdose. This is particularly the case when heroin tolerance levels are low, such as can be the case with sporadic users. Unfortunately, we are unable to provide free access to this article at this stage. Dietze P, Jolley D, Fry CL, Bammer G & Moore D (2006) When is a Little Knowledge Dangerous? : Circumstances of recent heroin overdose and links to knowledge of overdose risk factors. Drug and Alcohol Dependence, 84, pages 223 – 230. The aims of this report are to describe the circumstances surrounding recent non-fatal heroin overdoses among a sample from Australia – with a particular focus on associations between overdoses and individual knowledge of overdose risk. The authors found that, while heroin users can articulate knowledge of key overdose risk reduction strategies, this knowledge was not generally associated with a reduction in risk behaviours. In fact, in some cases, knowledge was even associated with increased reports of overdose risk behaviours. These findings have important implications for practice. Unfortunately, we are unable to provide free access to this article at this stage. Farrell M & Marsden J (2008) Acute Risk of Drug-Related Death among Newly Released Prisoners in England and Wales. Addiction, 103(2), pages 251 – 255. This study investigates drug-related deaths in England and Wales – using a sample of 48,771 released prisoners. 95% of the male deaths and all of the female deaths in this sample in the first two weeks following release from prison were drug-related – mainly through substance use disorders and drug overdoses. The researchers conclude that newly released male and female prisoners are at acute risk of drug-related death, and must be given appropriate prevention interventions. Unfortunately, we are unable to provide free access to this article at this stage. Green T, Grau L, Blinnikova K, Torban M, Krupitsky E, Ilyuk R, Kozlov A & Heimer R (2009) Social and Structural Aspects of the Overdose Risk Environment in St. Petersburg, Russia. International Journal of Drug Policy, 20(3), pages 270 – 276. This study – from Harm Reduction International’s official journal – aimed to uncover the various social and structural aspects contributing to fatal overdose risks in Russia, and assess the feasibility of overdose prevention interventions. Twenty-one interviews were conducted with ‘key informants’ – including drug users, treatment providers, toxicologists, police officials and ambulance staff. Despite broad support for overdose prevention measures, the study highlighted a number of key risk factors – including an inefficient emergency response infrastructure, insufficient training resources, and the dominance of abstinence-based treatment services. 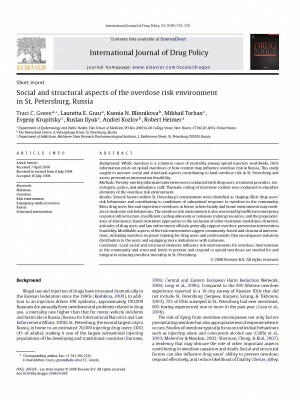 The authors concluded that local social and structural elements influence risk environments for overdose, and that interventions at the community and structural levels are needed. Grau L, Green T, Torban M, Blinnikova K, Krupitsky E, Ilyuk R, Kozlov A & Heimer R (2009) Psychosocial and contextual correlates of opioid overdose risk among drug users in St. Petersburg, Russia. Harm Reduction Journal, 6:17. The research seeks to identify and describe local attitudes, knowledge and clinical correlates of having either personally experienced or witnessed opioid overdose among a group of 60 drug users, both in and out of treatment, in St. Petersburg, Russia. The results suggest that experiencing or witnessing opioid overdoses are common, overdose knowledge is generally high, but self-efficacy for effectively intervening is low. Furthermore, the researchers concluded that drug users in St. Petersburg are interested in receiving overdose prevention and response training. Hakansson A, Schlyter F & Berglund M (2008) Factors Associated with History of Non-Fatal Overdose among Opioid Users in the Swedish Criminal Justice System. Drug and Alcohol Dependence, 94, pages 48 – 55. This study used a sample of 7,085 Swedish criminal justice clients with a history of alcohol and/or drug misuse, and aimed to identify factors associated with non-fatal overdoses. The authors found independent associations with previous suicide attempts and difficulty in controlling violent behaviour – which may have important practical implications. There were also associations between overdose and country of birth, heredity of alcohol problems, and severity of misuse. Unfortunately, we are unable to provide free access to this article at this stage. Strang J, Best D, Man L, Noble A & Gossop M (2000) Peer-Initiated Overdose Resuscitation: Fellow Drug Users Could be Mobilised to Implement Resuscitation. International Journal of Drug Policy, 11, pages 437 – 445. In this paper – from Harm Reduction International’s official journal – the authors conducted interviews about overdose experiences with 115 patients attending a service in London, England. Nearly half of the sample reported having experienced overdose personally (on an average of four occasions each), and almost all interviewees reported that they had witnessed overdoses (on an average of six occasions each). The study found that the sample were generally keen to expand their repertoire of overdose interventions (such as resuscitation techniques). Tracy M, Markham Piper T, Ompad D, Bucciarelli A, Coffin PO, Vlahov D & Galea S (2005) Circumstances of Witnessed Drug Overdose in New York City: Implications for Intervention. Drug and Alcohol Dependence, 79, pages 181 – 190. This study assessed the circumstances around witnessed non-fatal and fatal heroin-related overdoses in New York. Although many of the participants reported witnessing an overdose, relatively few intervened effectively. The study found that efforts to equip drug users to manage or prevent overdoses (including first aid training and the provision of naloxone), alongside the reduction of police involvement at overdose emergency calls, may have a substantial impact on overdose-related morbidity and mortality. Unfortunately, we are unable to provide free access to this article at this stage. Wines JD, Saitz R, Horton NJ, Lloyd-Travaglini C & Samet JH (2007) Overdose After Detoxiﬁcation: A Prospective Study. Drug and Alcohol Dependence, 89, pages 161 – 169. The aim of this study was to determine predictors of non-fatal overdoses after a period of detoxification from heroin, cocaine or alcohol. A cohort of 470 adults was followed after being discharged from an urban detoxification unit in the USA. The findings underscore both the high prevalence of overdoses among recent detoxification patients (especially opioid users) and the potency of prior overdose as a risk factor for future overdoses. Depressive symptoms were also a potential marker of overdose risk. Unfortunately, we are unable to provide free access to this article at this stage.